Ideal for professional pipefitters, the Pipe Trades Pro pipe calculator enables you to make a variety of calculations related to pipe layout and design. Pipe Trades functions: Right-Angles, Offsets and Complex Rolling Offsets, Fitting Angles, Bends, Angle/Slope, Percentage Grades, Drops, Feet-Inch-Fractions and Trig, Parallel Pipe Cutbacks, Pipe Areas, Fill Weights. Built-In-Pipe data with 7 different materials: Steel, Stainless Steel, Brass, Aluminum, Cast Iron, Plastic and Copper. Instantly solve pipe outside diameter, internal diameter, wall thickness, weight per foot, filled weight per foot, pipe internal data. Flow Rates, Velocity Force, Volumes, Liquid conversions, Temperature conversions, Paperless tape, Material Costing. Works directly in Yards, Feet, Inches, Fractions and Meters - including square and cubic formats. No need to convert to decimals. Pipe Calculator that Designed Specifically for Professionals Who Work with Pipe Layout and Design. Determine pipe measurements with ease using the Pipe Trades Pro calculator from Calculated Industries. This pipe calculator is designed specifically for pipefitters, steamfitters, sprinkler fitters, welders, and other professionals who work with pipe layout and design. Advanced functions enable you to calculate complex rolling offsets, parallel pipe cutbacks, and other piping dimensions, while built-in data lets you look up measurements for different types of pipe. 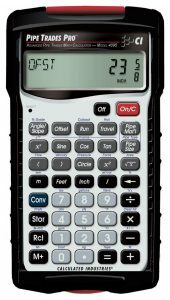 The Pipe Trades Pro can also serve as a standard math calculator, and it comes with a rugged Armadillo Gear case that's resistant to shocks, dust, and moisture. Ideal for professional pipefitters, the Pipe Trades Pro enables you to make a variety of calculations related to pipe layout and design, including complex rolling offsets, parallel pipe cutbacks, weight/volume conversions, flow rates, pressures, areas, and more. As a result, you can spend less time calculating and looking at charts and more time cutting, welding, and placing pipe. This advanced pipe calculator contains handy pipe data for seven different pipe materials: aluminum, brass, case iron, copper, plastic, stainless steel, and steel. Simply select the pipe material and pipe type and type the size, and the calculator can provide the pipe's diameter, wall thickness, filled weight per foot, and internal area. Excellent pipe calculator. 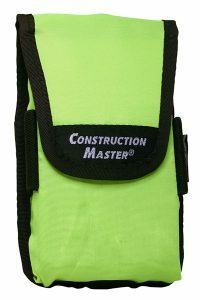 I have been using it out on the job to do layout, calculate grade, pipe lengths and hangers. 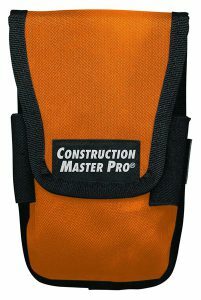 Easy to use, I would definitely recommend this product to my fellow tradesmen. This calculator has all the functions that I need for doing my work. I use this for checking piping design & construction drawings. One fine pipe welder & fitters calculator. A must for either. For all U out there get one U will not be disappointed. The product is good. If future versions can include electrode selection for different materials and quantity of electrode sticks per pipe joint, I think it will be perfect! I bought this pipe calculator with the thought that it provided a database of take-offs for fittings, which it does not. I have been using a generic construction calc. knowing the various multipliers for 22.5, 45 fittings and get the same results. I'm just a plumber, so I don't need the 'fitters' functions. If you need the advanced functions, it looks like something even a plumbing engineer could use. It's too smart for my requirements, but is easier to use after 20 minutes of reading the manual and playing with it. Definitely falls under the 'cool tool' category. This calculator is so much more than I had expected, I am very pleased with your product and have recommended it to others. I bought this pipe trades calculator for my husband, who is a pipe welder by trade but also does pipe fitting when needed. He already had two, I just didn't know because the company gave them to him and I never saw them, so the actually one I bought was passed on to a friend. However, the ones he has are the same and he loves them! Outstanding, A big help, in the field or detailing. I used it the first day I got it for parallel 8 inch rolling off-set. Extremely easy.